So I got on a plane to attend to a work related matter, thinking that there would be no time for scepticism for a week or two. But it’s funny who you meet when you least expect to. I’ve been to more Comicons (San Diego, CA) than I can remember, but that was a while ago. And this was my first DragonCon (Atlanta, GA). It turned out to be a heart-warming collision of the geek universes – fantasy and science – that I hadn’t suspected existed in such a concrete form prior to this. 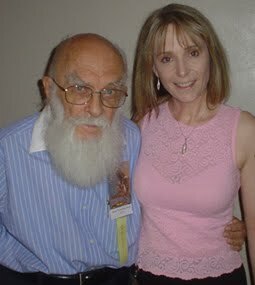 There was a full-on Skeptic presence with a program including James Randi, D J Groethe, George Hrab, Richard Saunders, Kylie Sturgess, Rebecca Watson and many others. There was a table for Skepchick, the local Skeptics and CFI. Sorry Rebecca, tried to catch you but kept missing you. However, I managed to say hello to James Randi twice, and got a piccie. The sciencey/skeptic vibe wasn’t just propaganda though. Along with all the T-shirts (eg. illustration right) I could see two very practical and humanitarian strands at DragonCon. One is well established. There have been blood drives at US conventions for a few years. Comicon and DragonCon have a friendly rivalry to see who can collect most of the red stuff. 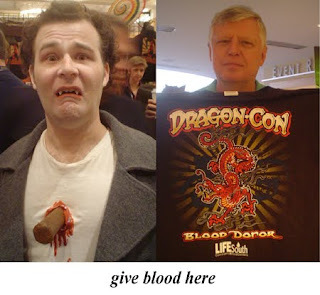 Comicon’s ‘Robert A Heinlein’ blood drive has collected 8,736 pints of blood over the last 33 years. Attendance this year was at the venue’s capacity of 125,000 and donations were generous. But they may have been trumped by DragonCon: despite the smaller attendance of 40,000, they had nearly 2,000 units by Sunday afternoon and thought they may be on for this year’s Elizabeth Bathory award. Actually, I just made that award up, but I think they deserve it. ‘Life South’ is the non-profit blood centre which runs the drive. The blood stays in the tri-state community (Alabama, Georgia and Florida) and is much needed in the summer months when donations usually drop. The second strand is newer and also much needed. The ‘Hug Me I’m Vaccinated’ campaign provides free TDAP boosters for against tetanus, diphtheria and pertussis (whooping cough). At the same venue there was free HIV testing and next year they plan to add flu jabs. Whatever scary stories you hear about the cost of American medicine, children’s vaccinations are available for free … if you want them. The government has a large budget allocation for free vaccines and complete vaccination is running at about 85%. However, the US has suffered as much as the UK from anti-vax propaganda. Jenny McCarthy, Bill Maher (Bill how could you? – you’re so funny, especially about religion) and Oprah have added celebrity momentum to Andrew Wakefield’s discredited theories. So ‘over-googled people’ think they’re doing their kids a favour by leaving them vulnerable to serious diseases that we could have left in the last century. The US has hot-spots of low vaccination rates and contagious disease outbreaks, such as measles in San Diego in 2008. 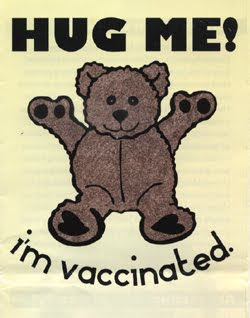 ‘Hug Me I’m Vaccinated’ is created, run or contributed to by three organisations: The Women Thinking Free Foundation; The Centre for Disease Control and Skepchick. By half way though Sunday, two hundred vaccinations had been given, such an enthusiastic take-up that the guys thought they may run out. What a fun Labor Day weekend!